Urban populations will continue to grow, but congestion will not. Smart mobility solutions will allow people to travel through cities faster than ever. We’re all in this together. Electrification won’t only affect the cars we drive, but the air we breathe. Your commute will begin and end at your front door. Because, in the future, you can be at work as soon as you step into the car. Shaping the roads of tomorrow means not only rethinking cars, it means rethinking every part of the car. Cars don’t use technology. They are technology. In terms of safety, performance, intelligence and connectivity, vehicles are completely different now than they were a generation ago. It’s a new world. Let us show you around. TROY, Michigan, December 10, 2018 – Today, Magna revealed its vision for a flexible vehicle interior centered around seating reconfigurability and the opportunities new mobility and autonomy will offer passengers in the future. Seat positioning will play an increasingly important role in creating a flexible space where drivers and riders can move cargo, get work done and interact with each other more freely. Magna reconfigures seating to offer more cabin space and enhance user experience. Magna pioneered reconfigurable seating with the game-changing Stow ‘n Go® Seating and Storage System on Chrysler minivans in 2004. Most recently, Magna brought the fourth-generation Stow ‘n Go to market on the 2016 Chrysler Pacifica and was first to bring the Pitch Slide EZ EntryTM seat to the North American market on the GMC Acadia. Magna designs seats at six R&D centers and manufactures seats at 50 locations around the globe. AURORA, Ontario, Dec. 13, 2018 -- Magna heads to CES 2019 with an all-new exhibit showcasing the company’s future vision of how electrification, autonomy and smart mobility intersect. 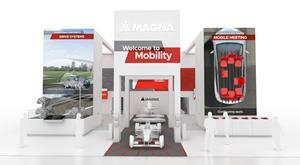 From a full range of electrified powertrain configurations to demonstrating how flexible cabin space will better meet both driver and passenger needs, the ‘Welcome to Mobility’ booth shows Magna’s future destination, where Mobility is TechnologyTM. Magna heads to CES 2019 with an all-new exhibit showcasing the company’s future vision of how electrification, autonomy and smart mobility intersect. 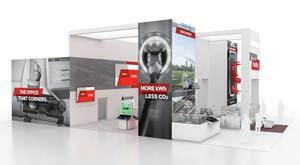 Visit Magna in the vehicle technology zone at CES 2019: North Hall of the Las Vegas Convention Center, booth #5616. 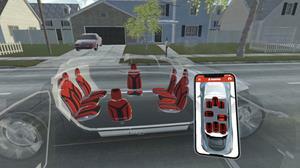 Reconfigurable seating will play a large role in smart mobility solutions of the future. Visitors can see through full scale demonstrations and a VR experience how long road trips, cargo transport services and mobile meetings can be transformed through technologies like haptic massage seats, personal sound zones and multi-sensor biometric sensing. Electrification: Demonstrates how multiple powertrain configurations with scalable electric power for hybrid and electric vehicles are applied to meet the varying consumer demands for efficiency, performance and dynamics. Autonomy: Showcases LiDAR object detection in action on a display screen and shows how Magna will master the complexity of autonomous driving through modular, scalable configurations for any vehicle architecture and autonomy scale. Smart Mobility: Highlights new seating configurations and smart city solutions which allow vehicles to be used and shared differently by making them more adaptable to varying needs and infrastructures. Magna experts will be on hand to answer CES attendee questions and provide additional information from Jan. 8-11, 2019. Visitors will find the Magna booth in the vehicle technology zone located in the North Hall of the Las Vegas Convention Center, Booth #5616. Visit www.magnamobility.com or follow Magna on Facebook and Twitter for more updates throughout CES 2019. Please click HERE for a PDF version of the release. SAN FRANCISCO, March 14, 2018 (GLOBE NEWSWIRE) -- Magna, a mobility technology company and one of the world's largest automotive suppliers, and Lyft, North America's fastest growing rideshare company, today announced a multi-year collaboration in which the companies will jointly fund, develop, and manufacture self-driving systems. In addition, Magna will invest $200 million in Lyft equity. The establishment of this partnership is subject to regulatory approval. This partnership is an industry-first and positions Magna and Lyft to enable the development and manufacturing of self-driving systems at scale. In addition to self-driving vehicles that will be deployed on Lyft's own ridesharing network in the coming years, Magna has the ability to deploy the technologies across a wide-range of use cases to benefit the entire global mobility ecosystem. "There is a new mobility landscape emerging and partnerships like this put us at the forefront of this change," said Swamy Kotagiri, Magna Chief Technology Officer. "Lyft's leadership in ridesharing and Magna's automotive expertise makes this strategic partnership ideal to effect a positive change as a new transportation ecosystem unfolds." "Together with Magna, we will accelerate the introduction of self-driving vehicles by sharing our technology with automotive OEMs worldwide," said Lyft CEO Logan Green. "This is an entirely new approach that will democratize access to this transformative technology." Copyright © 2019 Magna International Inc. All Rights Reserved.